We’ve just finished working on a brand new website for Bloomfield Laser and Cosmetic Surgery Centre in Groomsport, near Bangor, North Down. Bloomfield Laser and Cosmetic Surgery Centre brings the most up to date and high quality private cosmetic and laser dermatology to the people of Northern Ireland. 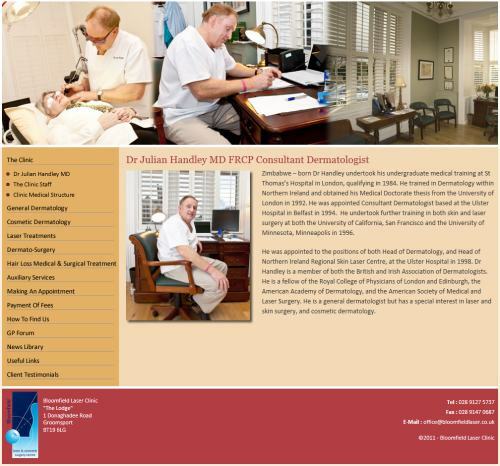 The clinic is lead by Consultant Dermatologist Dr Julian Handley MD. Our brief was to produce a website that was easily found and would provide a large amount of information to potential customers and patients about the services offered by the clinic as well as providing location information and facilities to allow the business to run swiftly. The website includes a GP Forum area protected by password access where local General Practitioners can find out information about Dermatology.